Razer is one of the most famous companies out there. Even computer enthusiastic around the globe have always loved their products. Be it a mouse, a keyboard or a gaming laptop Razer stands out to be the best option out there. However, the thing with Razer products is that it has the razer synapse not working issue. As a result, sometimes they stop working. Nonetheless, fixing the problem is not too complicated. 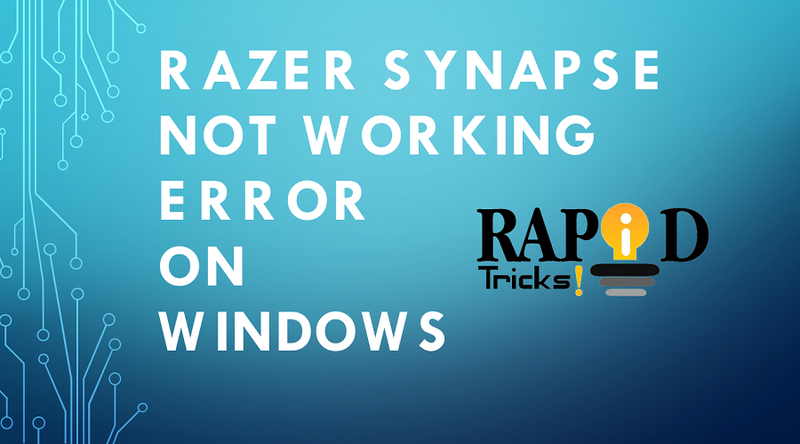 In fact, to help you out in this article I am going to answer the how to fix razer synapse not error. But before I go and talk about the solution, let’s just know what razer synapse is not working issue is. What is razer synapse not working issue? Well, the razer synapse is a cloud-based unified configuration software introduced by the company itself. The main purpose of the software is to configure all the other Razer devices under a single platform. This includes Razer mouse, keyboard and all other Razer products. The cloud-based application helps you configure the driver of each of the product without walking an extra mile. However, in some scenarios, Razer Synapse stops working, and this mainly happens because of outdated software. And fixing that is not too hard. Anyway, now let’s just talk about each of the ways one by one. So now let’s start from Method 1, I will explain all the 3 methods in details. So let’s get started without wasting time. Since I just mentioned that the error mostly appears because of outdated drivers. So yes, there is a high chance that you could actually fix the problem by reinstalling device drivers. However, in order to reinstall device drivers, these are the steps that you have to follow! Step 1: First of all you have to press the Win Key + R button at the same time to open the Run dialog box. Step 2: After that, you have to type down devmgmt.msc and hit the Enter button. This will open the Device Manager. Step 3: Now you have to look for the Human Interface Devices. Also when you expand the option, you will get to see lots of driver options for keyboards, mice and other pointing devices. Step 4: Now look for the Razer devices and right click on them and then select Uninstall device. Also, do not forget to select delete drivers option while uninstalling. Step 5: Now go to the Start menu and click on the Control panel. Step 6: Then go to Programs -> Program Features. Step 7: Over here look for the Razer Synapse and uninstall it. Step 8: After that disconnect all the Razer devices from your computer and keep them disconnected for a while. Step 9: Finally, connect the devices again to the computer and this time Windows will automatically detect those products. Plus it will also install the driver. In the end, check, if it has solved the Razer Synapse not working issue or not. Step 2: Next up, you have to type down “appwiz.cpl” and hit the Enter button. This will open up the Programs and Features window. Step 3: Now look for the Razor Synapse and Razor Core and then right-click on them and select Uninstall. Step 4: After that, you have to go through this following path: C:\Program Files (x86)\Razer and C:\ProgramData\Razer. Next, delete all the files present there. (Also make sure there no hidden files are there, just leave the directory clean). Step 5: Then close all the windows and restart your computer. Step 6: After the restart, press Win Key + R keys to open Run dialog box. Step 8: Then you have to type down devmgmt.msc and hit the Enter button to open Device Manager. Step 9: Now again go to the Human Interface Devices and uninstall every razer devices. Step 10: After that disconnect all the Razer devices from your computer and plug them back after 5 mins. Windows will not start detecting the devices and install the drivers. Step 11: In the next step you have to download and install the latest version of the .NET Framework. Step 12: In the end, go to the official website of Razer and download the Razer Synapse software and install it on your machine and you are good to go. Windows updates are meant for making customers experience better by improving functionality, performance and releasing security updates. Also, Windows updates help in fixing new bugs. However, in case if you have not updated your Windows from quite sometime now, then there is a high chance that you are getting the razer synapse not working because of it only. So it is a pretty good time that you must go ahead and update your Windows. We will talk in detail about Windows 7 here if you are using Windows 10 on your PC then its very simple and you can simply Click on Settings > Update & Security > Check For Updates. Step 1: First of all go to the Control Panel. Step 2: Next, go to the System and Security option. Step 3: Now click on the Windows Updates section. Step 4: Then you have to click on the option says “Check for updates and let Windows find and install (if available) updates”. Step 5: If there are any update Windows will automatically download it and install them for you. So those were the steps that you have to follow to get rid of the razer synapse not working issue. Go ahead and implement the methods and see which one is working for you. Also for any questions, feel free to comment below and let us know.